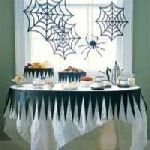 The Halloween party food ideas found here will create quite the stir at your next gruesome gathering. Let this year be the one when you invite friends and family over, prepare an irresistible dinner menu and let the fun begin. 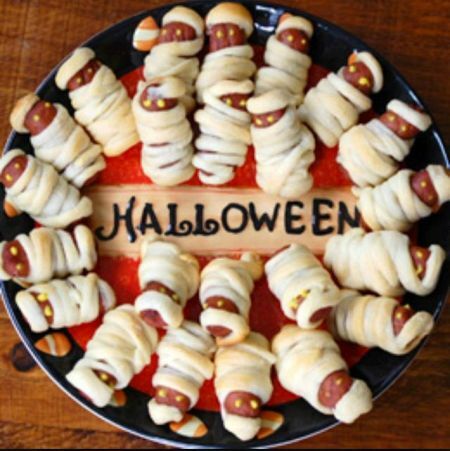 Tempt your guests with delicious Halloween party foods that are simple to make and fun to do. Your guests will be screaming for more. 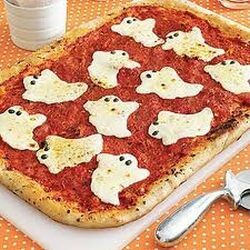 Halloween party food must look as good as it tastes, because half the fun is looking. One of the most noticeable elements of the table, be sure there is plenty. Prepare as much as you can in advance, leaving finishing touches to a minimum. 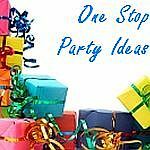 Plan an easy menu that your guests will enjoy and remember long after the dinner party is over. 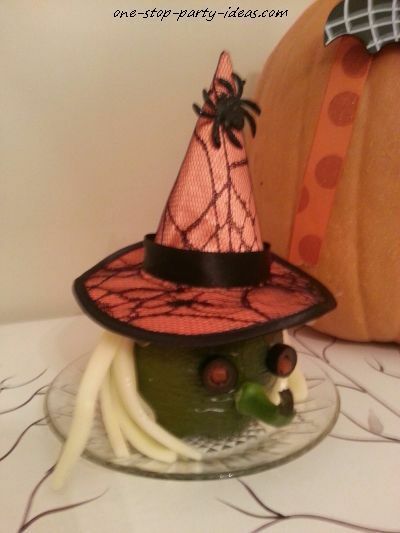 We love this idea of preparing beef stew and serving it in a pumpkin. This delicious one dish main course also becomes the focus of the table serving as the centerpiece. 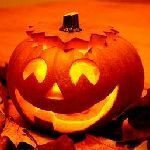 Use an eating variety of pumpkin, since jack-o-lanterns are not very tasty. Cut off the top of your pumpkin and save as lid. Scoop out seeds and fibers. Replace lid and place pumpkin in a roasting pan filled with about 1/2 inch of water. Bake in a 350 degree preheated oven for about 1 1/2 hours. 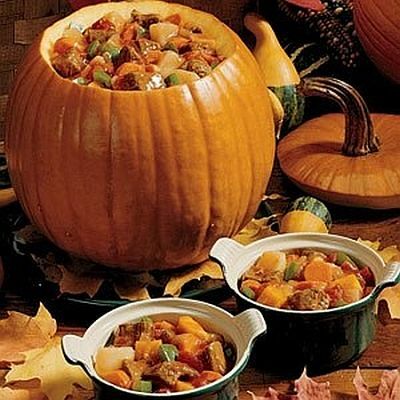 Prepare your favorite beef stew recipe and serve it in a pumpkin on a platter. 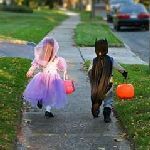 To complete your Halloween party menu, we suggest serving pumpkin muffins, a salad, and a simple dessert. 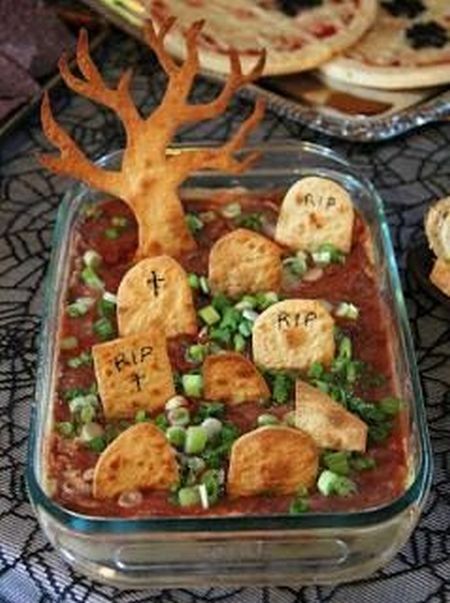 Dress your chili for Halloween. 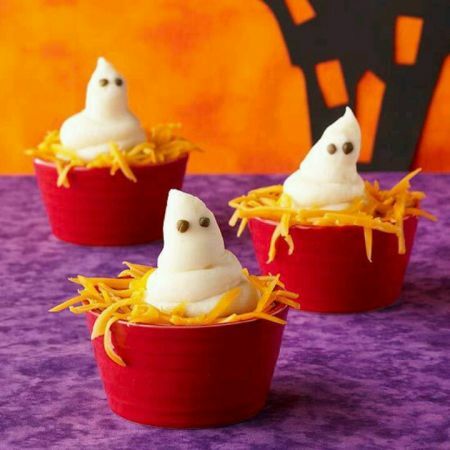 Spooktify each serving with a ghostly dollop of sour cream. Every bowl will have that festive Halloween flair. 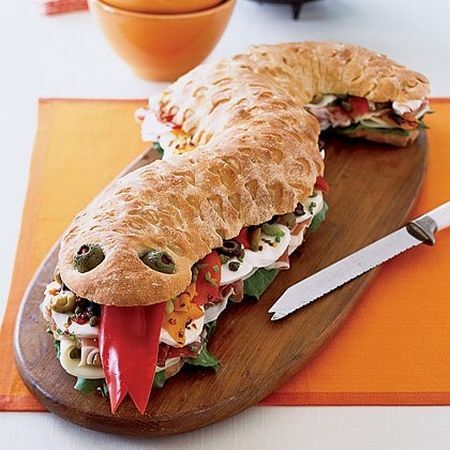 This sandwich, made to resemble a snake, will slither its way into your Halloween menu. To serve, cut into mini snake bites. Anything is possible with meat, bread, and a few toppings. Here's your chance to serve a tossed salad that will have guests taking a second look. We created individual salads that satisfied the appetite and fed the imagination with a fresh presentation. 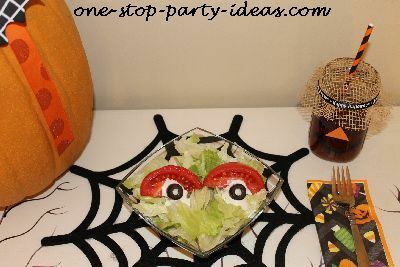 When better to put eyeballs in the salad bowl? Go ahead, bite the hand that feeds you! 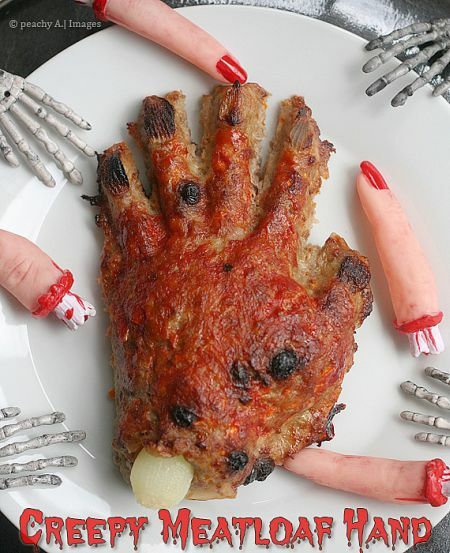 Don't be afraid to disturb your guests with this nail biting meatloaf presentation. Served in its own carcass, this stuffed pepper is dressed for the occasion. From the witches hat to the hair-raising string cheese, this addition to your Halloween party food ideas keeps every course in character. 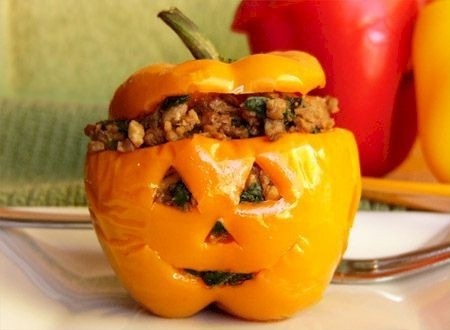 Make an eeriesistible dinner with stuffed peppers presented Halloween style. 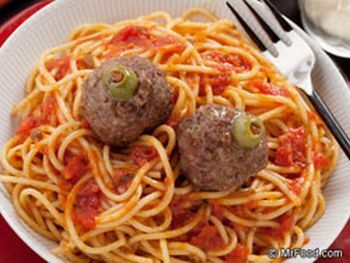 Quick, easy, and so delicious. 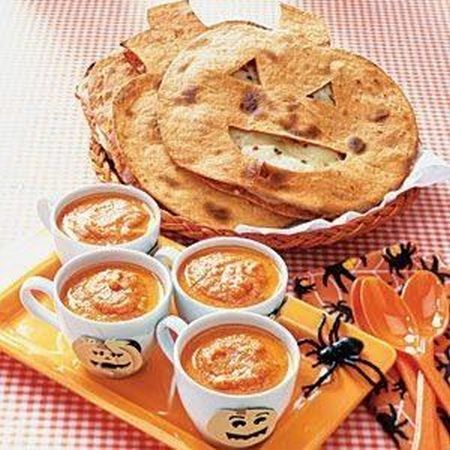 Using your kitchen shears, trim tortillas into pumpkin shapes. Cut out eyes and mouth with a sharp kitchen knife. Prepare your favorite quesadilla recipe and serve. Two enormous eyeballs watching over the noodles is a saucy presentation. We are always on the lookout for an eye popping entree. Lure them in with this bone tingling presentation. 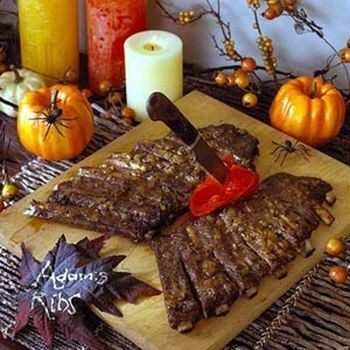 A Halloween food idea this gruesome gives a favorite rib recipe a wicked twist. The dish you are looking for. 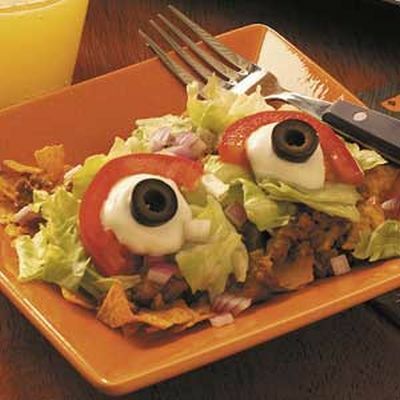 This taco salad will make you shriek with delight when you find out how easy it is to make. Layering the ingredients is the key. For an added touch, decorate your own glasses. Bring the Halloween spirit to the stemware with stickers or black electric tape. 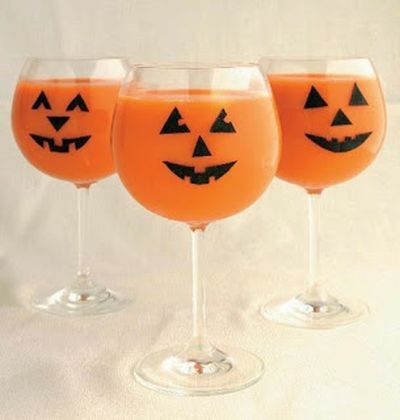 Simply cut out a jack-o-lantern face from the black electric tape and apply to stemware.